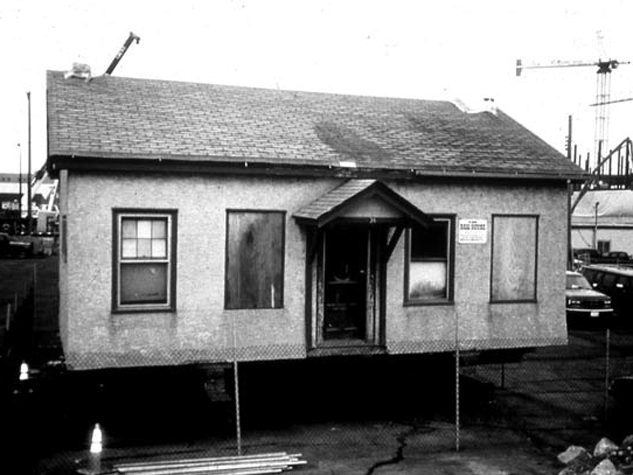 On my first visit to St. Paul there was a small house, with bulldozers moving around it, in the middle of the construction site for the new Revenue building. Still in place because of contention about its future location, it would ultimately have to be moved, as it occupied the site of the new building. 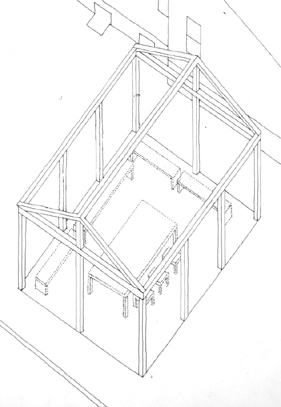 This simple pitched roof structure with its symmetrical front face was like the archetypal house in a child’s drawing. 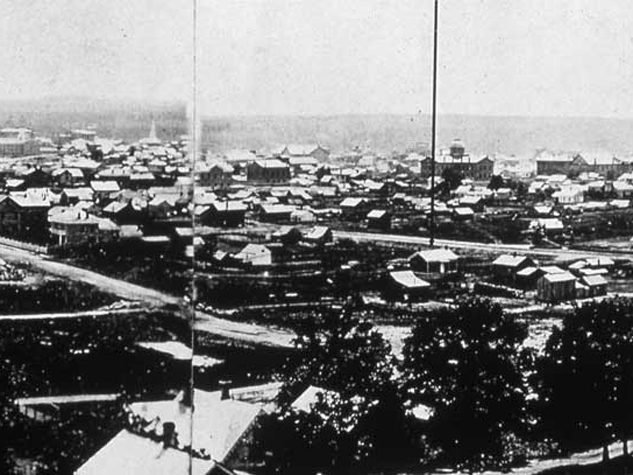 Built in 1858, the year Minnesota became a state, it was the oldest existing house in St. Paul and is clearly visible in early photographs of the city. The proposal shifts the wood structure away from its original location to become the focal point of the new building’s plaza. At its center this wood structure on its stone foundation was to be restored to its original form with clapboard siding. Two wide brick walkways leading to the new Revenue building mark the position and materials of the original streets; curb edges are used to define the grass areas. 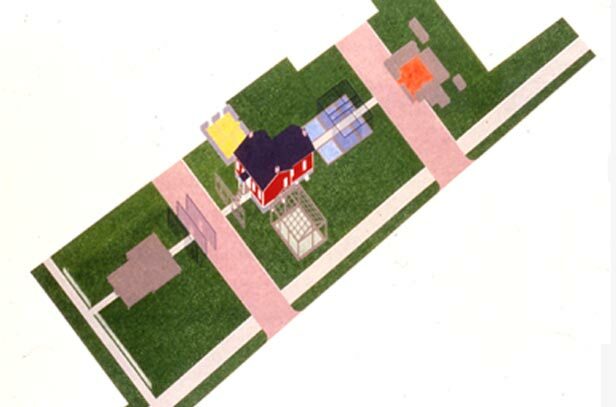 Within the large open plaza the components of the house are taken apart and laid out on the ground. An elevated wood plank platform traces the original footprint of the building; a low stone enclosure describes the foundation; a skeletal roof structure showing the framing is in one area while wire mesh walls define the layout of the rooms in another. Each of these incomplete elements become a seating area with a different colored terrazzo floor and simple ghost-like wire mesh pieces of furniture. Previous layers of cladding are indicated as is the framing structure of one of the walls of the building. At the far end of the site the lumber that is needed to construct a building of this size is stacked up to form another seating area. A double row of trees of the species that would typically be found in residential yards of the city runs through the site connecting these architectural fragments and bordering the street. In the dining area inside the Revenue building, broken lines in the floor covering mark and show its movement to its new position. Visitors to the building as well as those who work there daily have a variety of areas to sit. Moving through the different areas all the elements that make up this simple individual house become notable. Developed with Tom Oslund, Landscape Architect.